The search for a San Francisco 49ers' fan who mysteriously went missing during a football game at Levi's Stadium in Santa Clara, California, took a grim turn when fishermen discovered a body in the water near where the man vanished, police said. 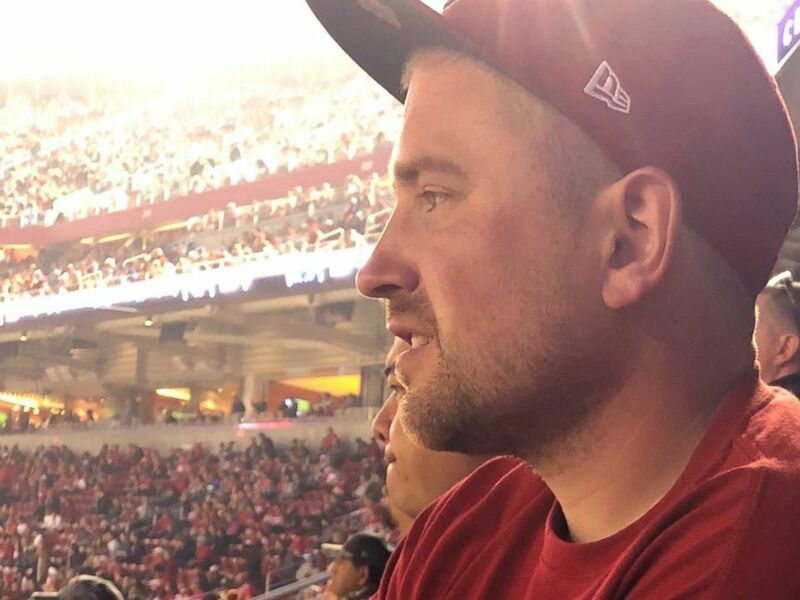 Santa Clara and San Jose police have been searching for Ian Powers, 32, a U.S. Army veteran from Spokane, Washington, since Nov. 12 when he got separated from his girlfriend and her two children during a Monday Night Football game between the Niners and New York Giants, police said. On Saturday afternoon, fishermen discovered the body of a fully-clothed man face down in the water about a mile offshore from a marina near Levi's Stadium, Lt. John Hutchings, spokesman for the San Jose Police Department told ABC San Francisco affiliate station KGO-TV. Ian Powers, of Spokane, Wash., went missing at the San Francisco 49ers vs. New York Giants football game at Levi’s Stadium on Monday, Nov. 12., 2018. "I believe the body was visible because of the low tide," Hutchings said. He said the Santa Clara County Medical Examiner is conducting an autopsy to determine the identity of the body and the cause of death. Powers’ girlfriend, Chelsea Robbins, said she and her two children attended the game with Powers and that they got separated in the fourth quarter. "He went to the bathroom and then got lost, or something happened," Robbins told KGO on Friday. Surveillance cameras showed Powers walking out of Levi's Stadium about 8:52 p.m. during the fourth quarter of a close game that the Giants won 27-23. Security cameras showed him walking west through the parking lot before losing sight of him at 9:03 p.m., authorities said. Robbins told police she had texted Powers and video chatted with him to coordinate a place to meet, said Santa Clara Police Department Capt. Wahid Kazem. Police tracked Powers' cellphone to a parking lot near the stadium and found his car abandoned, officials said. The body discovered Saturday was found in the water off Alviso Marina, which is more than a 2-mile walk from Levi's Stadium. The marina is in the jurisdiction of the San Jose Police Department. Santa Clara Police Department officials, who are investigating Powers' disappearance as suspicious and had asked the public for help in finding the man, were immediately notified that a body was discovered, Hutchings said. Neighboring law enforcement agencies joined @SantaClaraPD in an in-depth search for Powers in his last known location. Full details at https://t.co/N2yvGm3yDk. Power's uncle, Sean Powers, said he is baffled by his nephew's disappearance. "It's incredibly unlike him," Sean Powers, told KGO of his nephew leaving the stadium without his girlfriend and her children. "I've said this before, he's probably the most responsible person in my family."